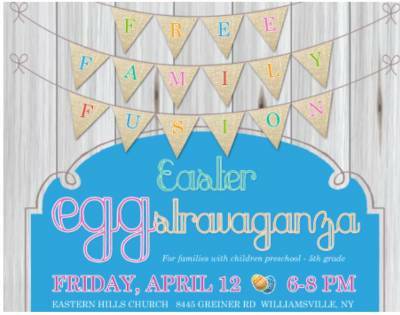 6:00pm-7:00pm: Easter themed games, activities, face painting, a sensory experience and a Petting Zoo with live baby animals. Join us at Eastern Hills Wesleyan Church at 8445 Greiner Road, Williamsville, NY. To check us out, to serve or for more details, visit http://www.ehwc.org/fusion or call 716-688-7165.